We’ve talked about the essential gear for setting up your home bar, but what about the actual liquor? The part you get to mix and match to create a tasty beverage? It’s difficult to say which liquors you should or shouldn’t keep on hand because your tastes are invariably different from my own. That being said, most of the alcohols mentioned below are versatile and work as a base for multiple cocktails—so even if you don’t like the flavour straight-up, they can still come in handy. Another thing worth mentioning up front is how important the quality of liquor is. Let’s move past the Smirnoff and Bacardi nonsense of your early drinking days, because most of these translate into terrible cocktails. In most cocktail recipes the alcohol is the main ingredient and flavour, so you’ll want to make sure it’s something worth tasting. Take an Old Fashioned for example. Its ingredients are bourbon, simple syrup, bitters, a bit of orange, and a chunk of ice to slowly dilute the drink. If you’re using a subpar bourbon, the bulk of the cocktail will taste subpar. Splurge the extra couple of bucks for the higher quality liquors, and you’ll taste the difference come cocktail time. The first liquor every home bar needs is a decent vodka. Skip the Smirnoff, Absolut, Polar Ice, and any other trashy vodka that brings back memories from high school, but also steer clear of the more high-end ones like Crystal Skull, which will set you back about $60 a bottle. Ketel One is my go-to, which tastes great and has a middle-ground price. When looking for a good vodka, the only rule to follow is it should be odorless and tasteless—like water. Anything that tastes like perfume or paint thinner is not going to do your drink justice. Rum is another liquor you’ll want to keep on hand, and it comes in two main varieties. Most cocktails call for white rum, which has a more subtle flavour; other cocktails, like a Dark ’n’ Stormy or a Hurricane, call for dark rum. The latter type gets its darker colour from an extended aging process. If money’s tight, just go with a white rum for now since it’s used in more recipes. Gin is also an alcohol you’ve likely dabbled with in the past, but it transfers well into cocktails. Most of the higher-end gins will boast about subtle tasting notes—all of which usually get drowned out by other ingredients in a cocktail. The juniper in gin will often overpower any and all other flavours added, unless you have a very well-trained palette. Bombay Sapphire and Beefeater will serve you well here, and both are on the cheaper side too. The last liquor I suggest always having on hand is bourbon. 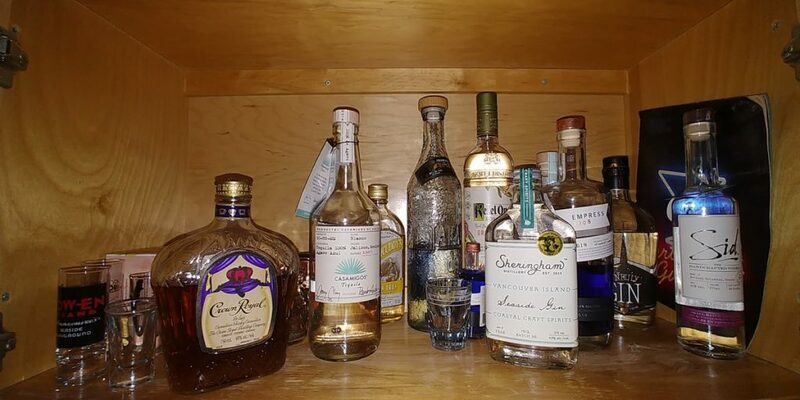 It’s the liquor I use most often, and it goes in so many different cocktails. Now, there are also some situations where you can get away with using a cheaper, lower-quality bourbon: If the cocktail calls for lots of citrus or other ingredients (like in a Bourbon Sour) then feel free to use stuff like Jim Beam; if bourbon is the main component (like the aforementioned Old Fashioned) then punch up and use something like Wild Turkey. Remember to use this list as a jumping-off point only and not as gospel. If you’re staunchly opposed to drinking rum, then don’t go out and invest in two bottles of something you’re not going to enjoy. Similarly, a lot of guides online recommend keeping brandy and tequila on hand, but I find these two liquors are a lot less versatile, so they go unused—plus, they’re more expensive. Stick with the basics, see which cocktails and flavours you start gravitating towards, and go from there.